If you own a spa or hot tub, then you understand that you need to cover it with the best hot tub cover when not using it to protect it. 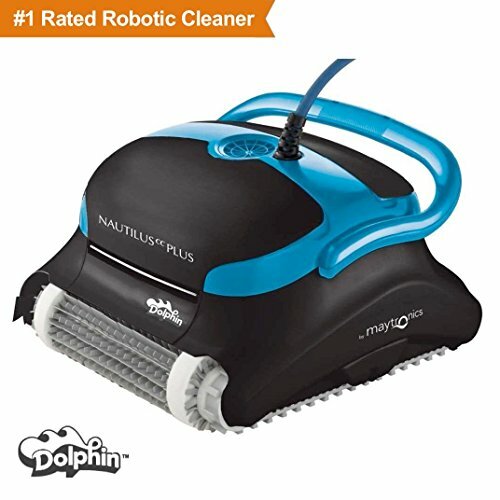 There is no doubt that this is the best way to maintain your facility, and we all like well-maintained hot tubs, don’t we? So, here we want to the answer the question of what is the best hot tub cover. From our buying guide and the review below, you will be in a better position to get the right cover for your hot tub. 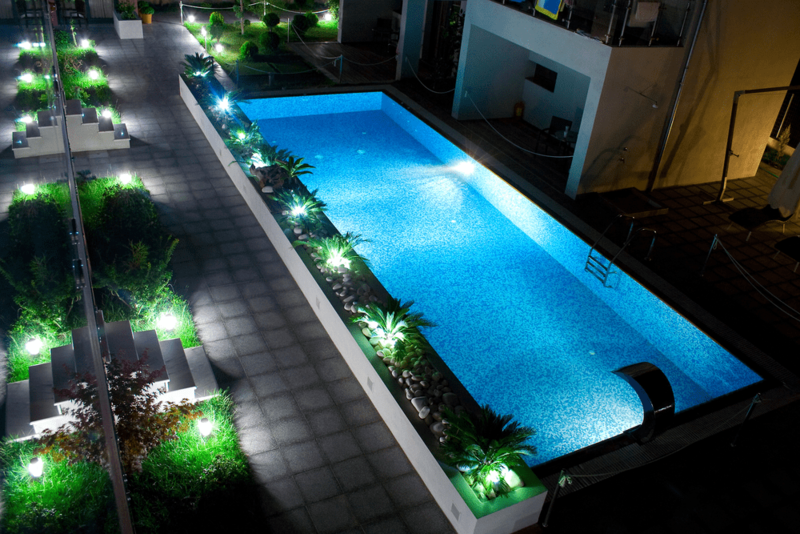 What do you need to do to ensure that you get the right cover for your hot tub or spa? You should consider the ability of the cover to withstand the specific weather condition in your area when using it. It is vital to have a cover that can handle every climate in your area. You won’t get any benefit if you get a model that won’t last even a season without showing signs of tear or wear. If you leave in a place with rain or cold, then you should get a cover that will withstand these weather conditions. If you area experience all the 4 seasons in a year, then get a cover that can withstand the changing conditions. The cover that you choose should come with vapor barrier ability for your tub. This is the part of the cover that is in charge of offering the foam cores covering so that water doesn’t seep through the cover. A good number of hot tub covers today are water resistant to avoid water logging on top. Therefore, ensure that you check out for this specific feature. These are yet other import aspects of a hot tub cover that you should consider when buying one. As much as you want to get a great cover, ensure that it covers your facility adequately. Furthermore, consider your tub’s shape as it will affect which cover you will need to choose. There are firms that make customized covers, but they are often a little expensive. Budget and price go hand in hand. First, you should have a budget in mind and then go through the prices of various covers. Take your time and go through as many models as possible before you spend your dollar on any one cover. Foam density – These covers come in 1-pound, 1.5-pound, and 2-pound densities. Higher density retains more heat, is stronger, and better. Foam thickness – These covers vary in thickness from 4 by 2 inches to 6 by 4 inches. Thicker foams retain heat and handle heavier loads. R-value – Although not as important as foam density and thickness, so manufacturers use R-value to show the quality of their covers and how effective they are at retaining heat. Marine grade vinyl – This is the standard for most covers since it resists water exposure. However, it might vary in quality, ranging from 26 – 34 ounces. Stronger vinyl offers better UV resistance. C-channel – This is a galvanized steel bar that runs the width of the tub cover to help reinforce it under pressure. This bar should be resistance to corrosion. Safety locks – These covers come with safety lock features. They are easily important if you have small kids. 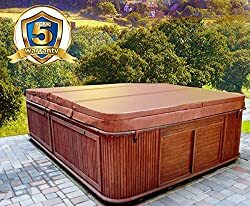 Here is a review of the top 10 hot tub covers on the market today. 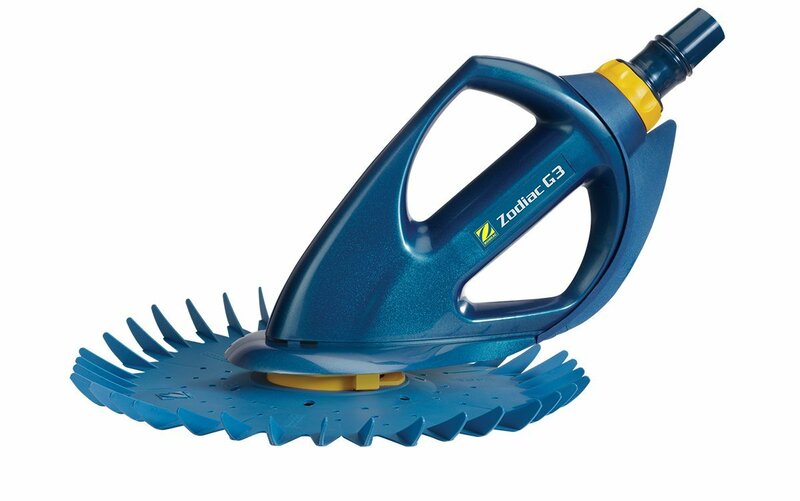 Classic Accessories 55-886-045101-EC Cover combines durability with a striking style and is fade resistance. Boasting of convenient features, the cover has reinforced padded handles which makes removal a breeze while the double stitched seams add a stylish accent and strength. Its structured vents remain open to thwart mildew and wind lofting and are enhanced with mesh barriers. Furthermore, waterproof backing ensures that your chairs and table are dry while the elastic hem cords shift easily via a special channel for the ideal fit. The striped webbing adds a beautiful accent and is one of the best covers in Ravenna collection. 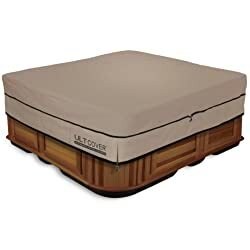 ULT Cover 600D is guaranteed to fit in an 85” by 85” hot tub and its actual size is 87” by 87” x 20”. Moreover, this is a hard cover for all hot tubes and is made of top quality polyester canvas material with environmental friendly vinyl backing. Tough enough to keep snow, leaves, dust, bird drops, and rain away, the cover is UV resistance and comes with a 5-year warranty. Also, this cover is 100% waterproof due to its seams taped but it is breathable. Well-placed structured air holes at 2 sides remain open to thwart mildew and wind lofting. 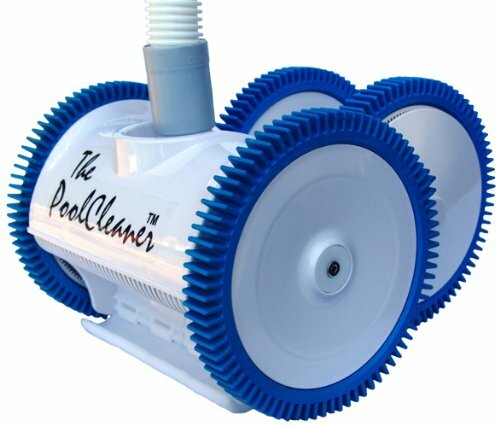 Pool Spa Part Heavy Duty Cover features high-quality easy fit storm straps that protect it from strong winds and also keep out unwanted substances like leaves and other debris. In additional, it bidding straps prevent heavy rain from reaching your tub or even destroying the cover. 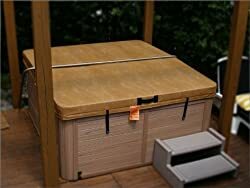 The cover comes fitted with clips at all ends of the straps that enable you to attach it to a deck or your hot tub. The cover is made of high-quality material and the straps are to ensure that they remain in tack for long. 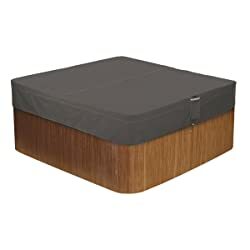 Classic Accessories 55-885-035101-EC Cover is perfect for a square hot tub that measures 86” x 86” x 14”. It is a weather-resistance cover that protects your expensive tub from different elements and harsh weather. 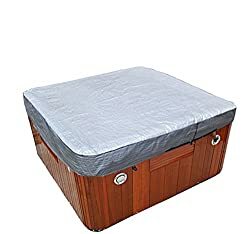 Actually, this is a more affordable addition that replacing your hot tub if it gets damaged due to elements and weather. The cover also features elastic hem cords with a toggle that allows you to adjust for a custom and tight fit. Also, the cover is made of high-quality material and comes with a limited warranty. It also lasts long. The Cover Guy Standard is one of the best tub covers that reduce power bills and prevents waterlogging. It is made of superior craftsmanship and the manufacturer has a 30-year experience of producing top-quality covers. The cover is custom made to make sure that it fits like a glove – just make your order and it will be manufactured. It is made of marine-grade vinyl and high-density foam to lock in the heat while keeping out the cold from your tub. 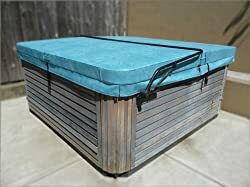 Additionally, the cover protects your hot tub from snow, ice, and rain and is ideal for moderate weather. 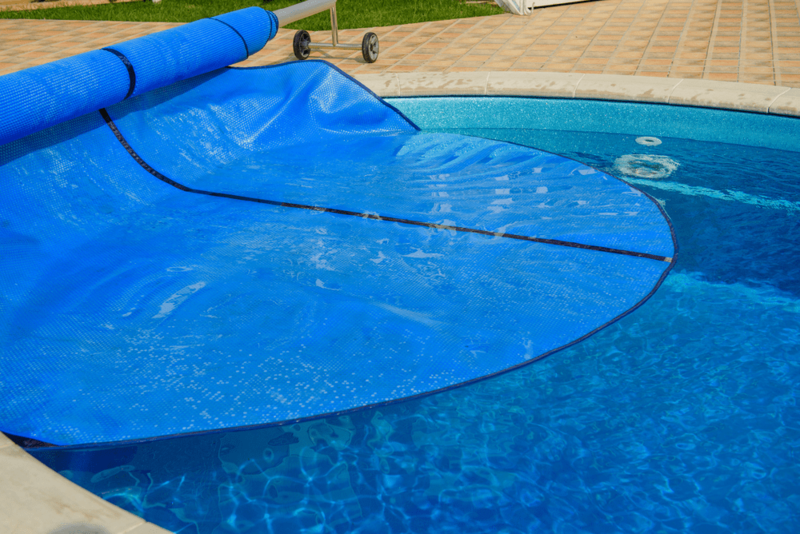 With BeyondNice Replacement Cover you can feel secure since the firm has been in business for over 3 decades delivering the best covers for hot tubs. 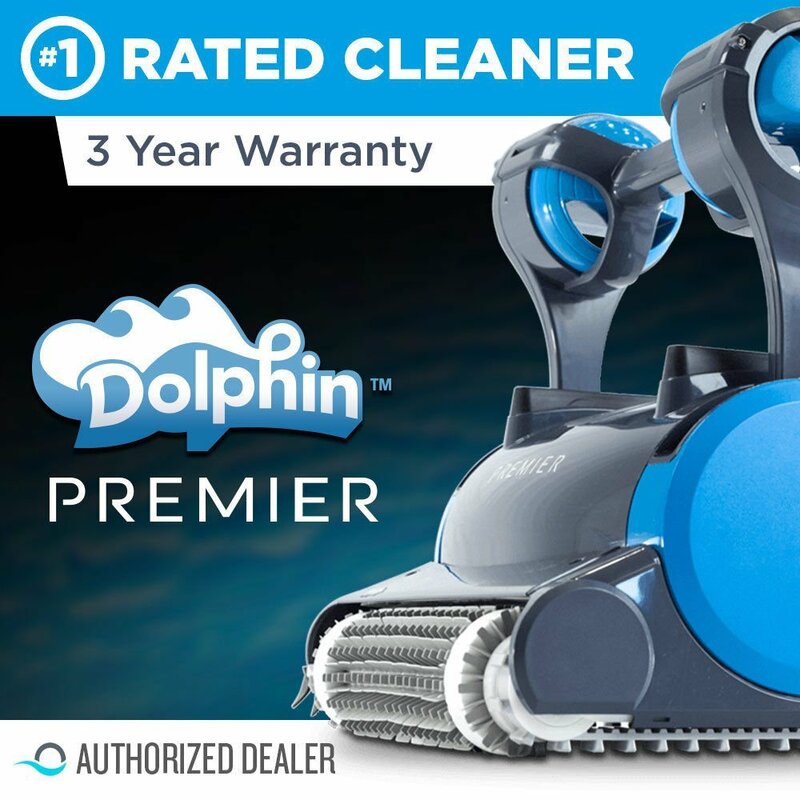 All their covers are backed with a 5-year warranty and are water resistance. This cover is able to withstand heavy rain and harsh weather and is also ideal for use on a deck. The cover is four inches thick, but you can easily order for a customized thickness. You will be excited to learn that the cover is made of high-quality material and last long. This is yet another cover from BeyondNice that comes with a 5 years warranty and is made of top-quality materials. The cover is able to withstand abuse from various elements including leaves, snow, bird droppings, and heavy rain. Furthermore, this cover is UV light protected and can be customized to fit your specific needs. 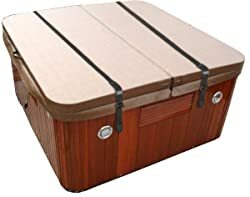 Also, the BeyondNice Hot Tub cover is water-resistance and comes with a great thickness of 4”. You don’t need to worry when you get this cover since the firm will be ready to assist you with any help that you require when installing it. This cover is made of UV-resistance material and is waterproof to ensure that it outlasts most covers on the market today. The covers cap size is determined by the buyer and comes a little bit bigger than ordered to make sure that it fits your tub. 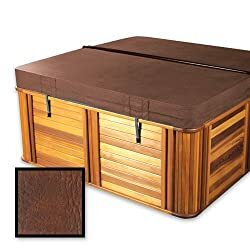 As well, the cover protects your tub from different elements including leaves and debris and will also prevent snow and rain from reaching your hot tub. With this cover, you are assured of getting many years of service without the need of getting a new cover any time soon. The Cover Guy covers are used by over 22,000 happy clients every year and the deluxe cover is one of their best models. 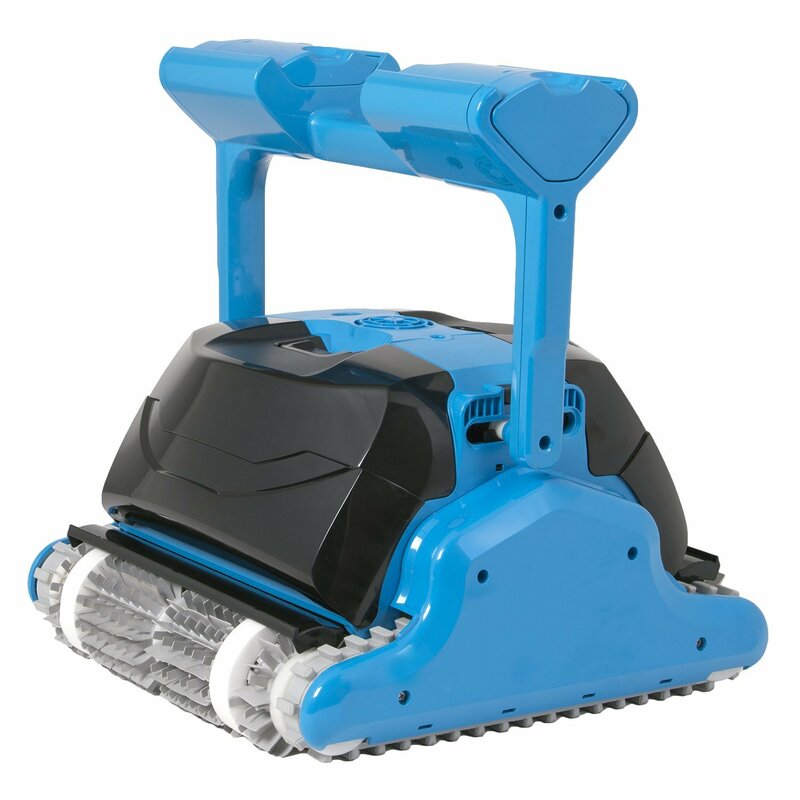 It is able to deal with harsh winter weather, eliminate waterlogging and even save you on energy bills. Made by professionals, the cover comes customized to ensure that fits your spa or tub perfectly. It is made of marine-grade vinyl and high-density foam, but it’s still light enough for your hot tub. The cover comes with a 7 years warranty and is able to withstand loads like snow and heavy rainfall. Replace your hot tub cover with the MySpaceCover and enjoy all the benefits of having a top-quality cover. The cover provides you a 100% satisfaction and is custom made to fit your specific needs. It is made of commercial grade material that is energy efficient and its seams are double stitched to prolong its useful life. In addition, this cover comes with a 5 years warranty. The size of your hot tub cover should fit well with your hot tub. Manufacturers often make a custom cover, so you can easily send them measurement and request for your cover. 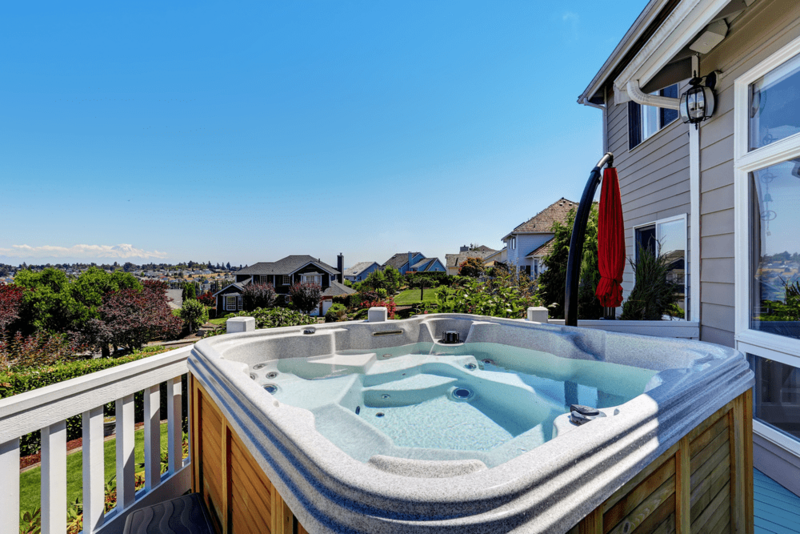 No matter the kind of hot tub you own, octagon, round, square, or rectangular, you need to take its measurements from the lip to lip or measure the outside dimensions of your tub. After getting the lip to lip figures, add up 1” on both the width and length to give you 1/2” of play around your cover. If you are replacing your cover, use the old cover’s measurement. Measure its seam. The skirt is the flap that hangs from the base of your hot tub or spa. Although it is just for adding aesthetic effect, it can still lead to some issues when not measured rightly. If your cover is too big, it will push and bunch the tub up. In case you have a wood rail, measure from the top of rail to the top of the acrylic hot tub. If not, measure from the top of the tub to the bottom of the lip, and then add ½” to the figures. Your skirt should be shorter to avoid the bunch. Use a carpenter square when measuring the radius. If you have a square tub, measure from the bend up to the imaginary line in the square. The smaller the radius the more accurate your measurement will be. Q: How long does a hot tub cover last? You should follow the warranty period to get an idea of how long your cover will last. Some come with 5 years warranty while others can offer a 7 or 8 years warranty. So, depending on the model and brand, your cover might last for about 8 years. 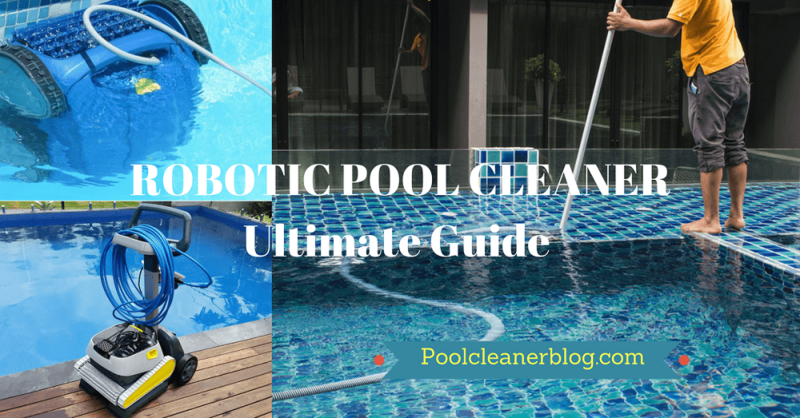 Q: How often should I clean my hot tub cover? If you cover has bird dropping or smell mildew, you need to clean it. Also, ensure that you clean it at least once per month. It is not hard to get the best hot tub cover for your hot tub or spa. All you need to do is to know your tub’s measurements and then request for a customized model and choose a assistant cover lifter. Classic Accessories 55-886-045101-EC Hot Tub Cover is one of the best models on the market today.